"Be kind, resourceful, beautiful, friendly, have initiative, have a sense of humour, tell right from wrong, make mistakes, fall in love, enjoy strawberries and cream … do something really new." that late, wet spring of '32. not talking of night gasps or sunlit, starch-white beds. until your fever broke and no one's heart with it. stained glass, coal, and undergraduates. unbreakable cipher and key of Dilly's Grecian eye. fisted in his pocket like a ring. and maybe still, long before you, died. as his program was pulled from its tapes. What can I construe from a letter, a photograph? the mind a black box. saying no, but look here, meaning love. Poems and short stories by Sonya Taaffe have won the Rhysling Award, been shortlisted for the SLF Fountain Award and the Dwarf Stars Award, and appeared in anthologies such as The Moment of Change: An Anthology of Feminist Speculative Poetry, People of the Book: A Decade of Jewish Science Fiction & Fantasy, Last Drink Bird Head, The Year's Best Fantasy and Horror, The Alchemy of Stars: Rhysling Award Winners Showcase, The Best of Not One of Us, and Trochu divné kusy 3. Her work can be found in the collections Postcards from the Province of Hyphens and Singing Innocence and Experience (Prime Books) and A Mayse-Bikhl (Papaveria Press). She is currently on the editorial staff of Strange Horizons. She holds master's degrees in Classics from Brandeis and Yale and once named a Kuiper belt object. 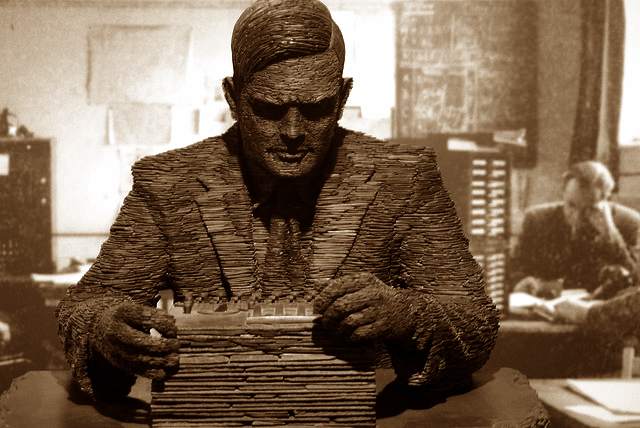 Photography: adapted from Turing, by Simon Bisson.